In December 2018 Olga Zinovieva will perform in two concert tours throughout the Netherlands, one of which is “The Messiah” by Handel. 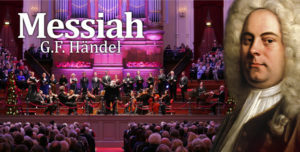 This monumental composition will be performed by The Bach Choir & Orchestra of the Netherlands led by the baroque specialist Pieter Jan Leusink and the international cast of soloists: Olga Zinovieva, soprano (Russia-Netherlands), Jana Mamonova, soprano (Russia), Sytse Buwalda, countertenor (Netherlands), Martinus Leusink, tenor (Netherlands) and Andrew Slater, bas (United Kingdom). There are seventeen concerts in total, six of which will be in the stunning Concertgebouw (Amsterdam).